So after filing the bags missing to the very German woman at that desk, we came into our hotel a bit later than expected. But after a steady breakfast at Oliv, things felt a little better. And then one Supra shuttle service (good service) to go to hell on earth… aka Bread & Butter. That tradeshow is the oposite of inspiration… Still, a lot of good people we know are there, so we kind of have to go. Besides, we had a few meetings booked. First of was Asics, who told us that there would be no Asics for 2013… I mean, not for lifestyle anyway. All lifestyle products will be branded with Onitsuka Tiger. But the door was not completely shut for still releasing some LE’s from the GEL series. After that we bumped into big surf dude Magnus Wedhammar who is now at Converse in Boston. Magnus was our first apparel sales rep for Nike back in the days so we go way back and it was good to see him of course. Then grabbed some invites for the party that we had with WeSC and Vice on the thursday and had a nice chit chat with the good people from Stockholms finest Skatewear brand. Danne Schön was still awake at this hour. Well, showing face and chit chatting is very tiring, so we all decided to have lunch in the sun. And then on to the ”new” section. It was called fire department or something. Said hi to CP-Johan (Carhartt-Pointer) on the way, and then had some dried reindeer meat at Denim Demon who had showed up at BBB for the first time. The main objective with Wednesday evening though, was to eat burgers at The Bird on Pontus’s expense. Not that it has to be on his expense, but it just is. And the best thing about going to The Bird, besides the killer burgers, is the fact that most of the good friends – and the reasons why you go to Berlin – are there too. Oh snap – I forgot. We found David C Wilson somewhere between the Asics booth and meeting Wedhammar. He snuck me a ice cold Small Sake and I kept it in my pocket for 30 minutes. Small Sake is best enjoyed ice cold. But still. David C Wilson! To sum up Day 1, we ended up at a Our Legacy/Rollerboys party somewhere… that was also fun. And for the record Viktor Tell could use a haircut. And you will find Our Legacy at Sneakersnstuff any day now. Sorry for not making it Woody, my bag got lost so I had to sort that itch out. Catch you soon, and happy birthday! Johan looking very happy, and Peter representing Small Sake. World record holder in peaking early – Danne Schön of WeSC. What? You didn’t think Jesus cared about streetwear? Personally, I like my sake ice cold. Luke warm sake that has been in my pocked for 45 minutes is not as tasty. Still – look for small sake to hit a Systembolag near you very soon. I good photographer would have had focus on the Footish guys looking for Jesus. A genius would focus on the SC in the WeSC logo in the back…. Mikkel of Converse and Micael from Vice are taking their Amish look very serious. I was only allowed to post this picture of Matt Sleep if I referred to him by his MC-name: Young Adonis. I SAID: DO YOU KNOW IF THERE IS A GOOD BARBER ANYWHERE IN BERLIN? Hold the phone! 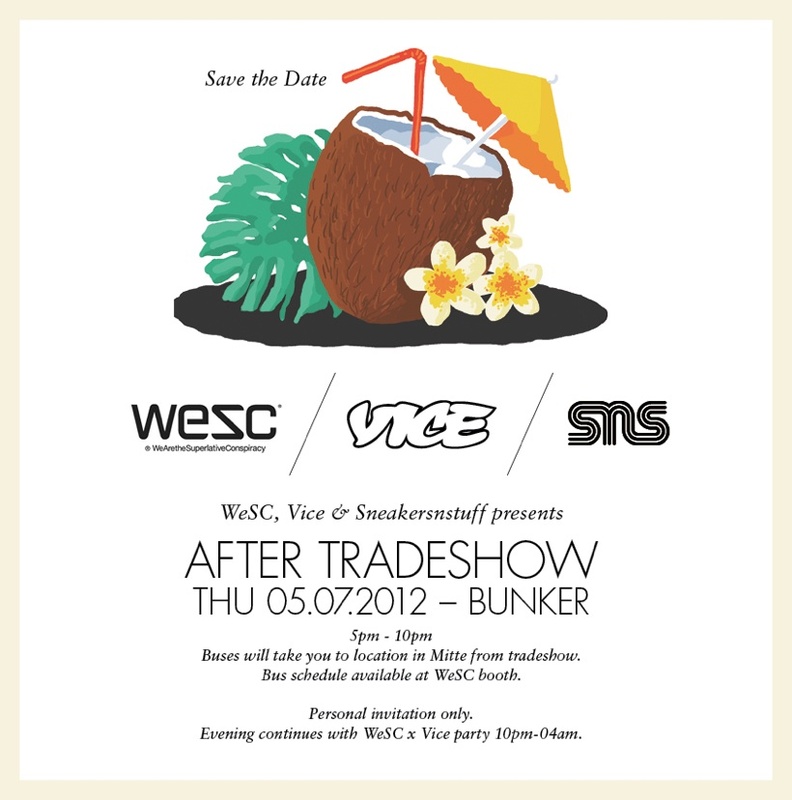 There is a WeSC / Vice / Sneakersnstuff party on Thursday! And yes yes yes, I know I’ve promised you pics and backtracks and what not. But here is the deal: it is time for Berlin tomorrow. And you know what that means. So there is no way I will be able to catch up on 3 months missed posts. I will do some eventually, because I have some really funny pics I want to share. But right now I have something more important to tell you. As you might have noticed – the WeSC stocks has gone through the roof (not really but still) and is up 25% past week. And going back one week, that is exactly when rumors about a certain collaborative party in Berlin on Thursday the 5th started to afloat. I any case – I know you all have a busy schedule in Berlin – but you know you usually end up at the WeSC party anyway so… here is yet another reason. More information to follow shortly (and by information I mean that the public has requested me and Capitan Jonas Wiehager to entertain in the VIP-room with music and cheers (and by public demand I mean myself – I actually asked to do it (it will be fun and it might help me not to drink way too much))). So – what are you doning on thursday?